The Consumer Price Index (CPI) increased 0.5 percent in the month of the Iranian year “Khordad” (ending June 21). The inflation rate has advanced 10.2 percent over the last twelve months. The food and beverages index turned up 0.4 percent in Khordad, largely due to the increases in the indices for root vegetables by 10.1 percent, fresh fruits 8.8 percent, leafy green vegetables 5.3, and meat 3.7 percent. The index for tobacco rose 0.5 percent in Khordad, largely due to the increases in the indices for domestic cigarettes by 0.7 percent and imported cigarettes 0.4 percent. The clothing and footwear index increased 0.4 percent, mostly as a result of the increases in the indices for footwear by 1.2 percent, ready to wear clothing 0.2 percent, tailoring, cleaning and laundering wage 0.8 percent, and clothing materials 0.2 percent. The housing, water, electricity, gas and other fuels index went up 0.1 percent which was attributed to the advances of the indices for rental equivalence of owner occupied houses by 0.1 percent, maintenance and repair services of the dwelling 0.5 percent, and rent of residential houses 0.1 percent. The furnishings, household equipment and routine household maintenance index rose 1.1 percent, largely due to the increases in the indices for “goods and services for routine household maintenance” each by 0.9 percent, “household appliances” and glassware, “tableware and household utensils” each 0.4 percent, household textiles 0.5 percent, and carpets and other floor coverings 0.4 percent. 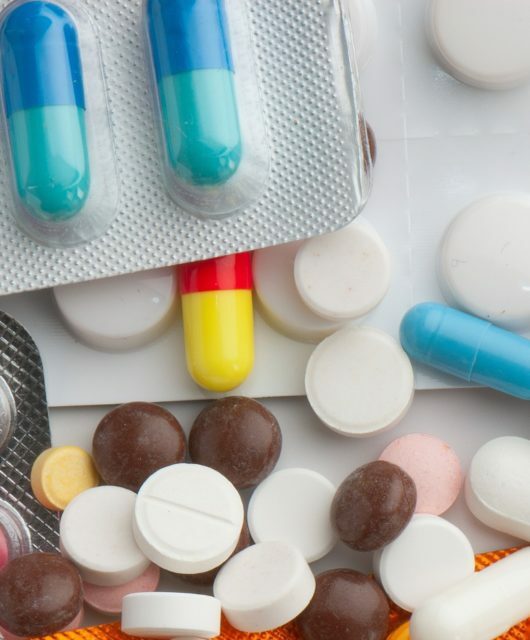 The index for health increased 0.7 percent, mostly as a result of the increases in the indices for medical, paramedical and dental services by 0.8 percent, “hospital services” and “medical products, appliances and equipment” each 0.7 percent. The transport index went up 0.5 percent in Khordad that was principally attributed to the increases in the indices for operation of personal transport equipment by 0.4 percent and personal transport vehicles 0.2 percent. 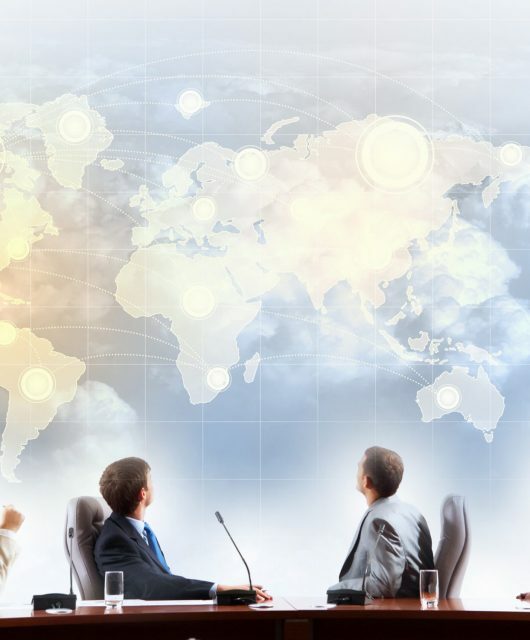 The index for communication went down 0.2 percent, mostly as a result of the decrease in the index for telephone and telefax equipment by 2.0 percent. 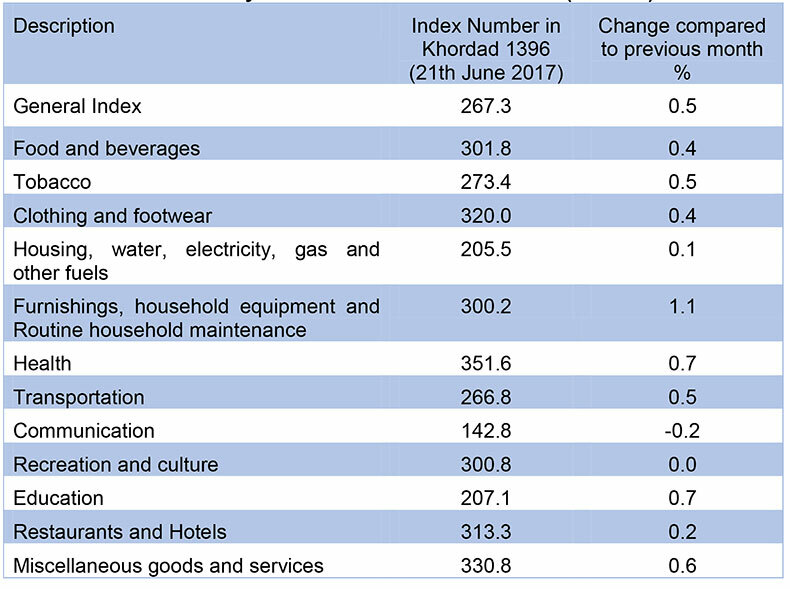 The recreation and culture index was virtually unchanged in Khordad. The education index advanced 0.7 percent over this month, mostly as a result of the increase in the index for supplementary courses tuition fees by 4.4 percent. The index for restaurants and hotels rose 0.2 percent, mainly due to the advances in the indices for food away from home by 0.2 percent and accommodation services 0.9 percent. The miscellaneous goods and services index increased 0.6 percent in this month. Increases in the indices for personal care by 0.8 percent and goldsmith wage 0.3 percent were the major reasons for this rise.